Recap of previous episode: Mr. A has been gradually using up the Lush and Rene Furterer shampoos and treatment. When asked about which will he recommend and consider repurchasing, Mr. A said both Lush solid shampoos. When asked about the overall review of the Rene Furterer treatment (after a total of 12 weeks), he said the effect was not impressive enough. I first heard of Nanogen through UK blogger, also my swap buddy, Kiran from My Cherry Lane. 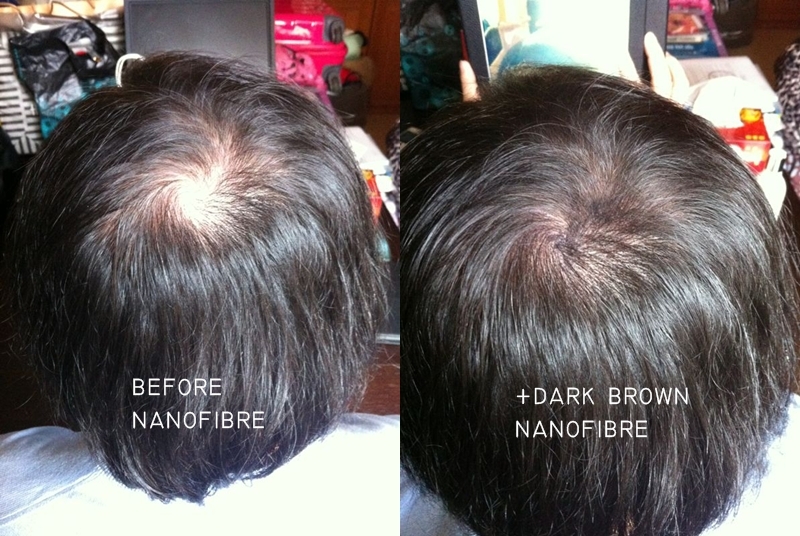 She did an amazing post on Nanogen's marvellous creation of Nanogen Fibres. I highly appreciate Kiran's bravery and honesty, and that's what I adore beauty blogs for: we are real! (Big applause for her sharing) Anyway, after reading her post, I kept this product in mind for a long time, until one day, I began to google whether I can obtain these products in Hong Kong. And guess what? I can! I found the website of Nanogen HK, and started looking through their range of products, and facebook, and youtube. Non-stop. The brand, to me, seems very neat and effective (good marketing perhaps? ), so I decided to get some for Mr. A to try out. The Nanogen Fibres are very fine natural keratin that come in shaker bottles (like pepper and salt). There are 10 shades available, which, I guess, cover all 'natural' colours human beings may have. For normal East Asian hair, I guess Black (for real black thick-in-diameter hair, or dyed-black hair), Dark Brown (normal black hair, like Mr. A or my family in general), Grey and White will work. Mr. A has about 10% of white hair, so as a professional Makeup Mixer (borrowed this term from Anna from VDM), I picked Dark Brown and Grey for Mr. A. You can see the results below, it is sensational. Mr. A has a little 'Mediterranean Sea', not too big an issue, but enough to demonstrate the camouflage effect of the Nanogen Fibres. I picked two shades, one in dark brown, another in grey. First I dust a bunch of dark brown onto the 'Sea' area, just like you would shake a pepper bottle. I blended it in slightly with my fingers, and then continue with more grey colour. The grey one appears to be quite dust-looking (due to the colour, of course) so I cover it up with an extra layer of dark brown. The effect was amazingly natural. After the dark brown - grey - dark brown sandwich camouflage, the sea was reclaimed! I set the reclamation with a couple of 'spritz' of the Fibre Locking Spray and the results held all day long. Personally, as I knew there is product, I find the reclamation area a little 'dusty', but that's only under direct sunlight and very close examination. However, I don't know if others will find the same. So, I asked every one in my family whether they find Mr. A's hair to be any different or strange. They all noticed the disappearance of the 'sea' and no obvious reclamation. That, I call a success! I am showing the rest of what I procured, with some of their ingredient lists. However, as Mr. A hasn't been trying them out properly yet, review will come later! Note: I asked the customer service through email, whether the conditioner or hair mask should be applied to the scalp or not, as some of the products out in the market suggest not to. 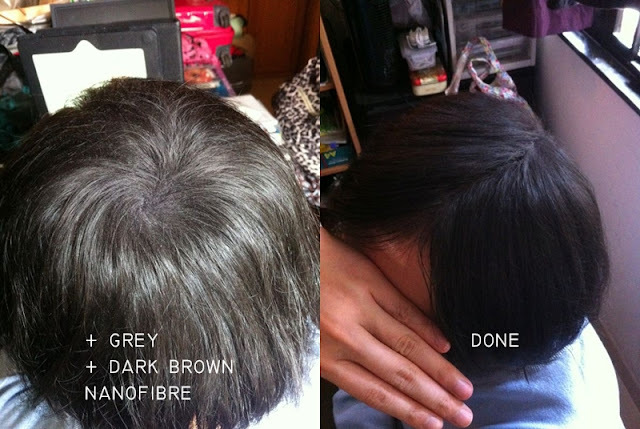 Nanogen replied saying their products can be applied to the scalp. Remember to email them and get 10% off if you want to purchase - good for my HK and Macau readers! I am not being compensated, just want to share the news with you guys! His Hair Story is a series of me documenting or reporting the hair story of Mr. A, my significant other. That may include product reviews, diet, daily routine, or styling tips. love the demo and looks very natural, I've seen people where I live with the scalp literally painted to hide those "seas"
some people around me like to keep certain pieces of their hair really long, and try to comb it and style it in a way that it kind of covers the bald area. it doesn't work nor look good. I guess hair loss is really something man likes to hide!